Having nuts during pregnancy is important as they contain essential healthy fat, nutrients, vitamin and calories necessary for a pregnant women in an early months. Almonds contain some essential nutrients vital for the healthy development of your baby. However excessive intake of raw almonds could also lead to pre-mature delivery. Hence make sure you don’t go overboard since almonds can increase body heat and fat. Almonds are not only delicious, they also come loaded with powerful nutrients required for healthy pregnancy. 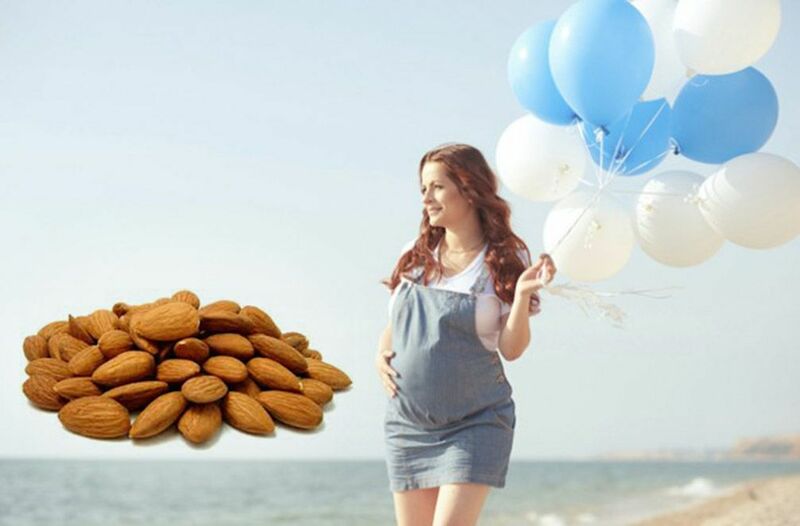 Almonds are loaded with protein, fiber, iron, zinc, vitamins A, B6, and E, calcium, manganese, magnesium, copper, folic acid and riboflavin.1 It is a very nutritious food to meet the increased nutritional needs of a woman during pregnancy. Almonds or soaked almonds are one of the best natural sources of folic acid. So pregnant women can munch on them for the proper development of the fetus. It will greatly help the brain and neurological system of the unborn baby. The high protein content in almonds helps in the healthy development of muscle mass in your growing baby. Protein intake is also important for you as a mother to gain enough strength and stamina for the oncoming delivery and motherhood. It also helps in healthy birth weight of your baby. Almonds are rich in iron, with 1 oz (28 gms) fulfilling 6 percent of your daily requirement. One of the many benefits of almonds during pregnancy is that you can meet the high requirements of iron at this stage in your life. As we know, almond also contain Omega 3 which is an essential source for the baby’s brain development and baby’s eyes development. The vitamin E content in almonds helps in healthy formation of hair and skin of your baby. It keeps the mother beautiful too. Almonds are a rich source of Riboflavin which helps and ensures baby’s brain development, muscle and bone development. Calcium richness in almonds reduce the risk of hypertension and pre-eclampsia during pregnancy. Calcium is essential for building strong teeth and bone in your baby.